When you think about it, the biggest bang for your buck occurs at the time that you publish a post and promote it on social media. After that, you rely on the good job you did optimizing the content for search engines so that it gets found on line and traffic gets driven to your website. There can be another 'bang for the buck' chapter in the life of this content, however. 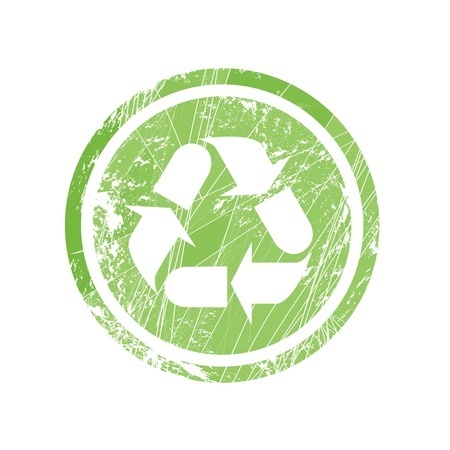 There are quite a few ways to recycle your existing content to multiply its evergreen-ability, and increase its overall effectiveness. We go into that below, but the first step is to review the performance of each piece of your content using analytics tools that are available in your marketing software, such as Hubspot, and then pick out the best performers. These are the articles that attracted the most engagement and when re-purposed together, should magnify this effect. Following are 12 ways to recycle blog content, including several ways to leverage older 'outbound marketing' materials that you may not have thought about. Be sure to keep the video contextually light and nimble while lasting 1.5 to 2 minutes in length. Your viewers are typically neurotic at best so attention spans are limited. Compile several blog posts into a single Ebook that addresses a larger topic. There are templates available for you to use, for instance Hubspot offers a set of free Ebook templates you can download and use to make the result look professional. If you don't already have posts that would fit well in an Ebook, approach it the other way around and build a series of posts on the same, larger topic that you then string together in an Ebook. 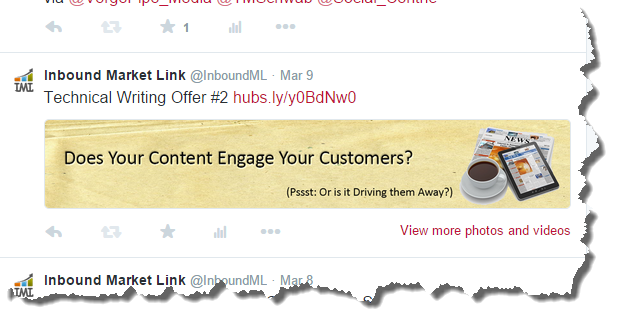 Instead of looking for content to promote through Twitter externally, bring it home with your own writing. Extract salient points out of your content and tweet them as a series over time and link them back to their parent article which you stage on a landing page on your website. If you aren't using a social media scheduler there are several out there that can be a great help here. Readers love info-graphics and if these are well designed, they can spread via social media like wildfire because they are easy to share and enticing to look at since your readers can generally absorb information quicker studying an image than they can by reading an article. The trick here is to make sure your info-graphic looks professional, so either locate online solutions to help you out, our pay for its development via someone skilled in the art. Slideshare is an online platform for uploading slide presentations for viewing, a lot like Flickr and YouTube. You can take your content and boil it down to a series of slides with graphics and images that convey your message in a storybook fashion. Alternatively, just upload existing presentations that you might have, they will be indexed by Google and with a link back to your website will help drive traffic. Along with the move toward video, podcasts are still popular as well. iTunes makes it easy to manage your podcasts, so why not audio-ize your entire blog? It's easy to go into greater detail on topics to add more value. Podcasts can be played by your readership while driving which may appeal to some. Since white papers are more or less just small Ebooks, you might experiment by either splitting out an Ebook into several white papers to make a series out of them, or bundling 2 or 3 similar blog posts together to create an Ebook. 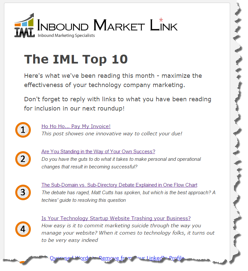 One of the easiest things you can do is to create a monthly newsletter with links to your latest content. These are great ways to reach out to your contacts with added value rather than asking them to buy something. Just list up your previous month's posts with a short synopsis on each post as a lead in, and send out the email. Similar to templates, checklists can be very useful to print out and have at hand. Many of our posts add value by creating lists such as this, or steps to do something in particular like how to properly implement landing pages the link points to a sample post that is a good future candidate for us to convert to a checklist. A great way to attract the focus of your audience without the burden, expense and time investment of a face to face speaking engagement. Webinars have gained considerable traction as legitimate ways to transmit information and develop leads. If you decide to record your webinar, once it is over, it can be used as a call to action on your site as a way to generate additional leads. We use Join.me for group communication such as this. For small audiences, join.me works great for webinars. The beauty of inbound marketing is the fact that it isn't nearly as expensive as outbound marketing. On top of that, re-purposing existing content multiple ways helps to generate more business without substantially increasing marketing spend while magnifying marketing efficiency. The key is to keep re-use in mind from the beginning so that it is easy to accomplish in the end.